Ein wichtiger Schritt auf dem Weg zur Solar Academy ist getan! Solartechnologie ist zurzeit eins unserer wichtigsten Projekte in Süd-Ost Nigeria. Zur bessere Koordination des Projektes haben unsere Partner vor Ort im Januar 2019 eine Stiftung – die Chizoba Solar international Foundation – gegründet. Juristische Verantwortliche Person für Solar Akademie in Nigeria: Barrister Silver C. Udeogalanya-Orizu. 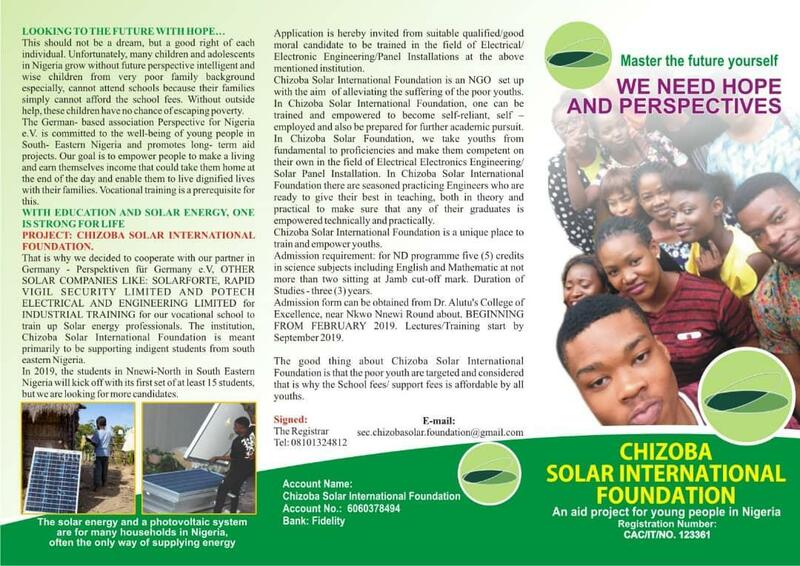 Rechtsträgerschaft des Solar Akademie: CHIZOBA SOLAR INTERNATIONAL FOUNDATION. Weitere Informationen zu Solarfirmen vor Ort entnehmen Sie bitte dem beigefügten Flyer. Thanks to a generous donation of € 500, Perspektiven für Nigeria was able to complete a thorough renovation of the infirmary at the Mater Dei Awkuzu DDL school in Anambra State. 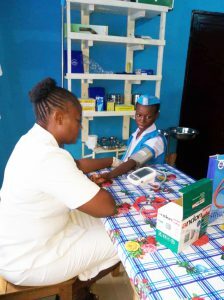 Equipped with new beds and medical equipment, the station has been able to do much better work since October 2018. The expression of joy and thanks to the donor were great! 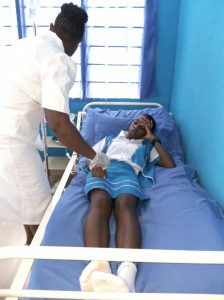 Infirmary and hospital wards in schools are very important in Nigeria. They are often the only access to medical care for the children. Help us to set up more stations! In our application Formular and our statutes, you will find the necessary conditions for our association to offer scholarship within our means; please fill the form, download our associations statutes to see if you are eligible. Send back the form signed by your school authorities together with your results, picture and admission letter all as scanned documents via the email on our website under contact. Akwa-Mmiri Association can ONLY accept those that are eligible and in accordance with the Associations financial capacity. We shall accept new intake once a year before the beginning of each academic year depending on our annual budget (from December – May). For us to continue this work, we need help, more members, more godparents as well as those who are willing to give us financial assistance for this beautiful purpose. We are assuring you that the DONORS WISH MUST BE RESPECTED. In our flyer you will find all the activities of Perspektiven für Nigeria e.V. as well as the various assistance options in a short form. An application form for membership in our association is also included. 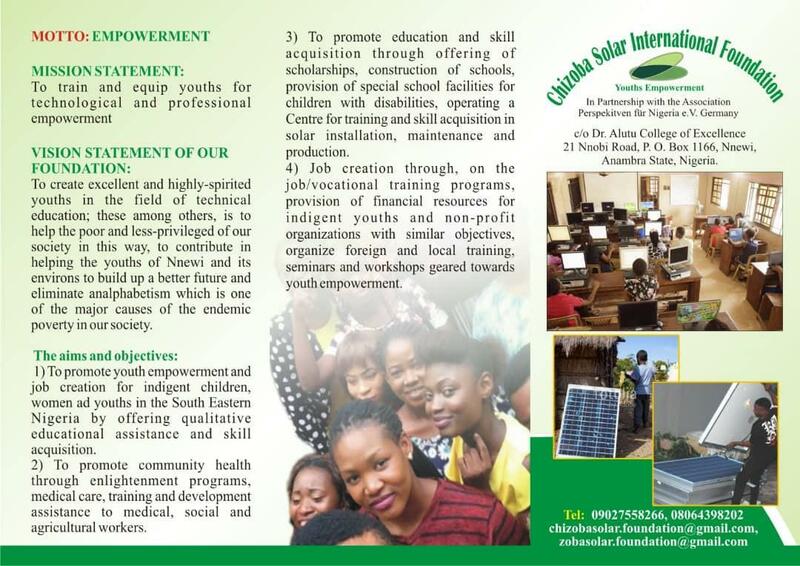 The founding of a vocational school for solar technology in currently one of our most important projects in South-East Nigeria. With a donation, you too can help us realize the important goal. In our flyer (PDF format) you will find some more information about our association and the current projects. 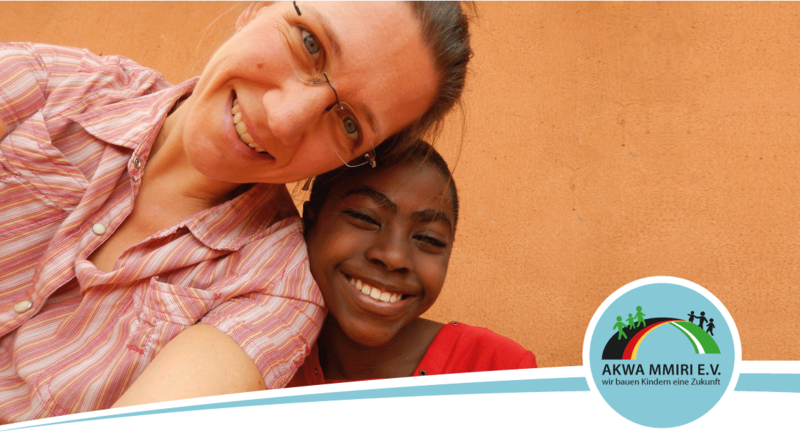 You can become a member through sponsorship – if you like it – this generates a personal relationship with a child. You can take on a longer-term responsibility and provide primarily for the school education of your fosterchild. The association Akwa Mmiri arranges sponsorships for children in South-East Nigeria. You decide for yourself whether you want to finance your sponsored child’s kindergarten, elementary or secondary school or even a university education. Here you will find an application form for taking over a sponsorship. In order for us to be able to further promote our aid projects, we need your support. 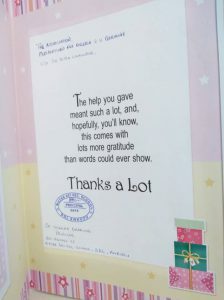 In addition to a donation, membership in one of our Asociations is a popular and great way to help other people. With your membership fee, you provide us with flexible help wherever it is most needed. 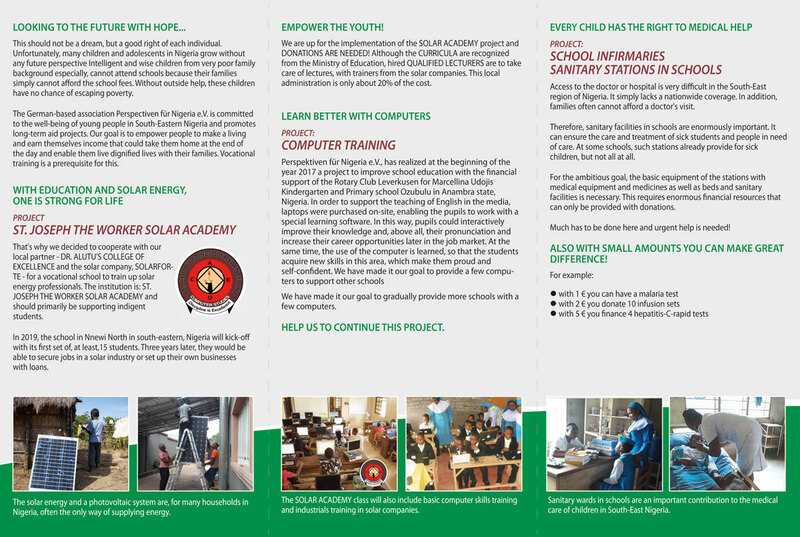 Help our sponsoredchildren in South-East Nigeria! 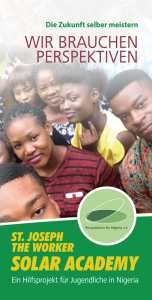 Become a member of Akwa Mmiri e.V. or reach out for prospectives for Nigeria e.V. The membership declarations can be found here in PDF format. Declaration of Acceptance AKWA MMIRI e.V. Declaration of Acceptance PERSPECTIVES FOR NIGERIA e.V. Statutes PERSPECTIVES FOR NIGERIA e.V.